On All Souls Day (November 2nd) St. John Cantius Church in Chicago’s West Town neighborhood celebrated their annual Mozart requiem Mass. This requiem Mass is highly unique among requiem Masses, which themselves are underutilized. The parish performs, live, Mozart’s Requiem, installs a catafalque in black dressings at the foot of the altar, and celebrates the Mass in Latin. Mass with all the trappings — the smells and bells, as it is sometimes pejoratively described — is rare in 2018. According to the Latin Mass Directory, there are only 4 parishes in Chicago that regularly celebrate the Latin Mass. And among those parishes, St. John Cantius is the most grand. It is old, historically Polish, baroque, and extremely Latin. It is an anachronism, from the altar to the incense to the priests. Everything about it is old and out of date — and that is why it succeeds. Mozart’s Requiem Mass, which Cantius celebrates every All Souls Day, is a parish tradition. And yet even for a parish accustomed to Latin — their daily Mass is in Latin and two of three Sunday Masses are as well — it is an enormous deal. 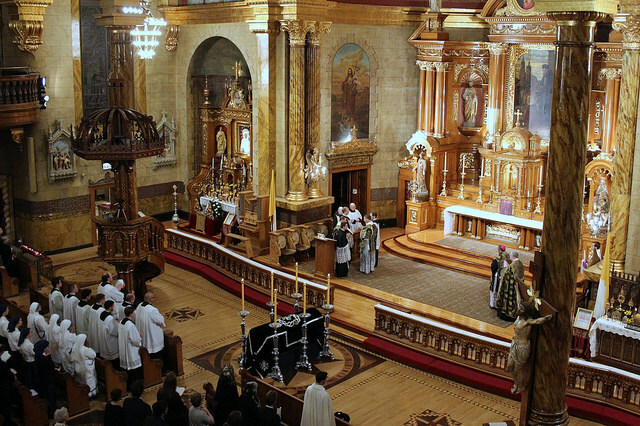 A Latin parish like this in Chicago is a treasure for Catholic and non-Catholic alike, and especially for those completely removed from something so moving. Critics of the Latin Mass say it is old and stuffy and gaudy and incomprehensible. They have a point. The Latin Mass can be all those things. But it is more than that. Where post-Vatican II Masses are postmodern, the Latin Mass is old. Where Novus Ordo Masses are flexible, it is uniform. Where the Ordinary Form is austere, the Extraordinary Form is gaudy. And where 21st Century Masses lose themselves in culture, there is the Latin Mass, surprisingly comprehensible with a Missal and some effort. The Latin Mass is one of the most direct and clear links to the past. Beyond the use of Latin — a language otherwise dead and gone — is a direct link to centuries of Christians who participated in the Mass using the same rubrics, order, readings, prayers, and even choreography. There are precious few direct links to something so far in the past. The presidential inauguration ceremony, perhaps, or the coronation of the British monarch are civic traditions steeped in history. But in neither case do they reach back some 10 centuries or more as the Latin Mass does. The celebration of and access to the Latin Mass keeps this tradition alive and provides a constant counterbalance to an ever-changing culture, both within and outside of the Church. From the outside, the Extraordinary Form offers a disengagement from the world. It is so deliberately old and unchanging, so grounded and so grand, that it forces you to look beyond the day-to-day and see something larger and more meaningful. And from within the Church, it serves as a worthy and necessary counterweight to reform movements that sometimes do more harm than good. The physical design of old churches was meant to dictate several things: ornate artwork on the walls, domes, and arches was meant to pull the eye upward and spark meditation on the divine mysteries, the altarpiece was placed in the apse to orient the congregation properly, and incense was meant to draw together and sanctify the individual properties into one event. That’s why removing the old altars was one of the most detrimental post-conciliar things that could have happened: by reorienting the altar to meet the people, the Mass is now too often (though not always) about the people themselves. The altars, statues, and colorful art at parishes like St. John Cantius may seem like an anachronism. But in the course of the Mass they serve a very real purpose.